By now, everyone has heard of the heartbreaking news about the New Zealand Shooting targeting Muslim worshippers at Masjid Al Noor in the city of Christchurch during Jumu’ah (Friday) Prayer. This was not something that I wanted to write about again. This is not something that we should ever have to write about or experience anywhere in the world. Yet, this is an ongoing occurrence in the Ummah, whether it be in Afghanistan, Palestine, Syria, Iraq, China, India, Yemen, Canada, the USA, or beyond. It is happening everyday and it never stops. There are just too many tragedies to list. I know this will be brought up and I want to make something clear before I begin, Insha’Allah. We Muslims do not EVER believe that lives in the West are more valuable than lives anywhere else, Subhan’Allah. If you feel pain for one more than the other, then please rethink this and change this tribal, nationalistic thought process. It has no place in Islam. The Ummah is one body and we must all remember this, Insha’Allah. Taking this most recent tragedy, which is recieving unprecedented attention, we are again being called upon by Allah SWT in such an apparent and blatant way, Subhan’Allah. While the temptation to share the video of this or any other crime may be great, it is crucial to refrain, not just on your personal communication, but on all social media. While I am writing this, I keep getting message after message with not only the video, but play by play details of the attack. Subhan’Allah, it begs the question of if we give Allah and His Deen the same attention and promotion. Nevertheless, we need to be diligent in not spreading this further, as the reason the perpetrator filmed it was for this very reason – so that it would be shared and spread so as to strike fear in our hearts and to glorify his own actions. He does not deserve his name being uttered, he does not deserve his actions being displayed, he does not deserve anything. …and He is with you wherever you are. And Allah, of what you do, is Seeing. Above all, we should not share the deaths and injuries of our Brothers, Sisters, Sons, and Daughters in such a morbid way. These were human beings and they deserve honour and respect in death. Their families do not need to watch their loved ones suffer and die before their eyes over and over again, because we cannot help but share this, Subhan’Allah. Please think of others and their feelings. This can be psychologically scarring to many and we should be sensitive to that fact, Insha’Allah. In the time of the Prophet Muhammad (SAW), they would cover up the Shuhadah (RA) as soon as possible after battle, so not to dishonour the dead. 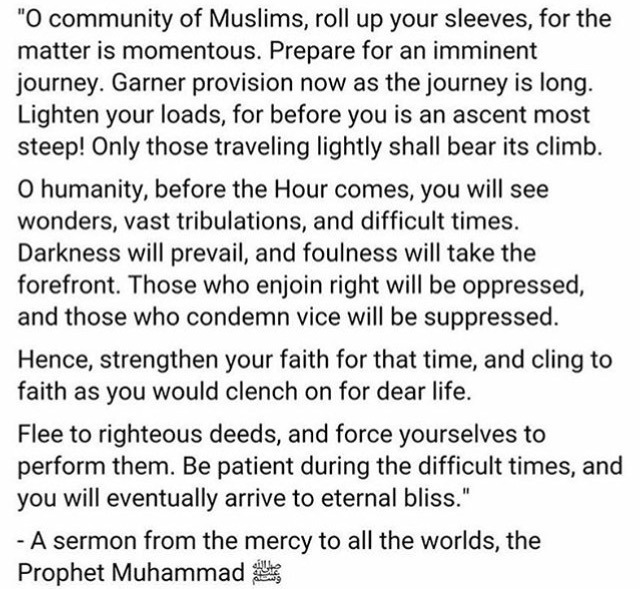 We have to follow this example, Insha’Allah. For those who are truly grieved by this, please be strong and know that Allah SWT is in control. Allah’s plan and His Majesty is present over all things. Therefore, the solace we can take from this tragedy is that those who passed died as martyrs, in a state of Wu’du, during Jumuah Salah, on a blessed Friday, and in the blessed month of Rajab. Allah SWT has elevated them in death, an honour He does not bestow on many. His Plan, this giving and taking is not without reason or purpose. He will deliver His Believers and His Promises are True. Our shock and horror at this tragedy and so many others in the Ummah today should make us contemplate our own Deen and deeds, perceive our own limited life, and take action in a positive way through du’a, tawbah, and truly trusting in Allah. It should bring us closer to Him and strengthen our bond as an Ummah. We speak about unity in passing ways, but no one speaks of how this can be accomplished and if they do it is most often from a place of superficial acceptance and the dunya, but true unity comes when we practice as the Prophet Muhammad (SAW) did. True unity can only come with the Book of Allah and establishing His Kingdom in our hearts, lives, and in the earth. If we all truly did this and made Him the core of our beliefs, actions, and how we are raising the next generation, then there would be no room for disunity and vice, Insha’Allah. We live on and should honour the memories of those who have gone before us, the ones who are facing Truth as we sit and ponder, by correcting our relationship with Allah and true worship. We spend so much time attempting to learn about, impress, and gain acceptance from the non-believers, yet we don’t give Allah, His Book, or His Messenger (SAW) the same honour and status. This is especially true in the wake of tragedy within our Ummah, but it should be the opposite. True victory will not come from the people, true victory only comes from Allah SWT and our Worship of Him alone. Many times tragedy blurs lines, realities, and even beliefs, but we must remember that Truth will always prevail and we want to be standing on the Right side when these crowds and eyes clear, Insha’Allah. Allah’s pleasure and love come before all else. Allahu Akbar – Allah is Greater! No one knows the moment of their death, but what we do know is that it is an inevitable journey that we must all prepare for with sincerity and true submission. We will all have to face Allah SWT alone with what we earned and what we ignored. How long will we keep leaving it to another day or another stage in our lives? How long will we attempt to beautify this deceptive dunya when our energy and time should be focused on Him and His Commands? He’s Calling. Allah is Calling! Please answer Him. We must stay awake this time. This entry was posted in Diary of a Slave and tagged adversity, Allah, attack, australia, awake, believer, christchurch, compassion, courage, death, devout, faith, God, heaven, Islam, masjid, massacre, mosque, Muhammad (PBUH), muslim men, muslim women, muslimah, Muslims, new zealand, pain, peace, religion, rise, sacrifice, shahid, shooting, shuhadah, steadfast, terrorist, truth, ummah, wake up. Bookmark the permalink.